» Tasked with the creation of a giant craft elephant - ideas? Tasked with the creation of a giant craft elephant - ideas? I'm reaching out to the forum for design ideas. 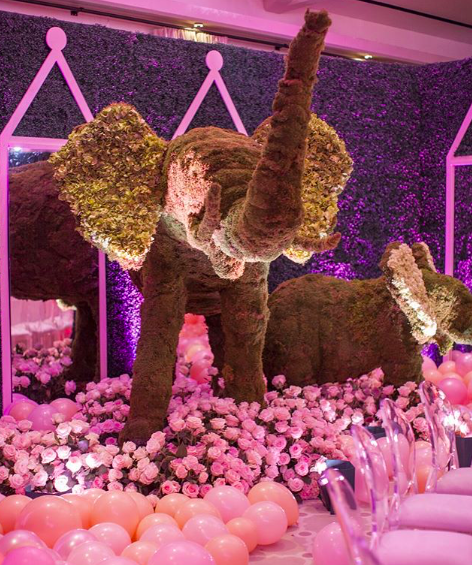 I've been tasked with the creation of a giant craft elephant for the purpose of a themed-party based off of the recent Kardashian baby shower. My craft skills are somewhat limited, and I'm very much trying to simplify this into something I can put together in an afternoon. Perhaps constructing something out of grey bristol boards? Any advice on how to build a frame to attach everything to? Re: Tasked with the creation of a giant craft elephant - ideas? Are you estimating the size will be near life-sized? That is a very large project for someone new to large crafts! And it's going to take a LOT of time. And there's no way that we will be able to give you step-by-step instructions. The lightest armature (interior support) will be corrugated cardboard or rigid foam sheets. And by the time you're finished, 'light' will be a relative term. A large elephant of Bristol board would cost a fortune. Discarded corrugated boxes/containers will be the cheapest. You can strengthen the folded places in the cardboard by glueing flat piece of the same material over the bent areas. The larger the elephant, the more rigid the interior support needs to be. Go to Google Images and type in 'slotted cardboard armature'. To get the same effect, you can work on one side of the form, using cardboard pieces with a fold on the attachment edge, to make it stand out. Break down the body parts (body, head, legs, ears) and design them separately. If this is a large elephant, also consider how you're going to transport it. You might have to move it in sections and finish it on-site. If you can move it in an open pickup truck, be sure to strap it down firmly. The body shape will be filled out with wire netting (chicken wire in U.S.), or crumpled newspaper held in place with masking tape or packaging tape. The smoother, finished shape is then covered with newspaper, brown paper, or fabric, glued on. It is best to paint the glue onto the sticking side of the 'skin', rather than immersing the paper/fabric into the glue. Press firmly. You will have to do multiple layers, so let dry thoroughly every three layers, or so. Common white PVA (Polyvinyl acetate) glue is probably most suitable for a project like this. For a large project like this, buy a 4-litre bucket of it. You'll have noticed that elephants have rather wrinkled skin, so you won't have to waste time getting the finish very smooth, but have a photo of an elephant nearby, so you can get the wrinkles in the right direction. With this in mind, a final skin of old bedsheets could be very useful for large areas of wrinkles. When the elephant is completely dry, paint with acrylic paint (also purchased by the 4-litre bucket). If you have no way to transport the elephant in one piece, find someone who knows about building who can help you design how to do a realistic job at those joints. One of the main problems with large creations is that you must eliminate the tendency of the armature to flex. And the larger the design, the greater tendency to flex or shift with weaker (lighter) materials. With smaller creations, you can have success with weaker materials. This site's owner, Jackie Hall, has a book available on papier mache (Papier Mache Art & Design). She's even made a baby elephant (pages 66-69). Her armature is just wire mesh, formed into shapes and attached ('sewed' with wire) to each other. She could do this because it's relatively small. This is a computer-generated design, but it gives you the basics of what you need, and it could be formed by hand. You would need to draw the side silhoutte and one from the back or front. If getting the slots placed accurately is intimidating (and it would be for something so large), you could eliminate the slots and cut a pair of the side shapes (for the rib area, for example) adding a 6 or 8 cm (2 or 3") strip before cutting, that you could score with a dull knife and fold at a right angle, and then attach that flap to the side of the main body shape with glue (hot glue would be fastest). But that would have to be braced to hold it in position, because the fold itself would cause shifting.